As we wrap-up the first stage of the Indigenous Education Strategy’s implementation (2015-2017), we reflect on the progress made to date with 25 new projects and programs successfully researched, designed, built and implemented during the first three years. By the end of 2017, remote schools were implementing new approaches in early childhood, primary literacy and numeracy, secondary pathways, community engagement and workforce including expansion of the Families as First Teachers program, establishment of a new Transition Support Unit, the girls’ engagement program and Employment Pathways. Launch of a new Northern Territory Pre-School Curriculum. Establishment and resourcing of six new integrated Child and Family Centres to act as community hubs for the delivery of essential early childhood services across government. Creation of new early childhood transitioning resources to help make each child’s transition through the early years as smooth as possible. Expansion of the Families as First Teacher (FaFT) program from 21 to 33 sites with about 1661 children and 1676 parents or carers participating in the program at the end of 2017. Implementation of the ASQ-TRAK early childhood development screening tool in 70 per cent of remote communities to more accurately determine and plan around individual child development needs. Establishment of a new Transition Support Unit (TSU) to assist remote students transition to boarding school. TSU serviced 78 remote schools and more than 1900 Northern Territory students from more than 250 different locations in 2017. 32 schools delivered the Employment Pathways program and the NT Board of Studies endorsed the Employment Pathways curriculum in 2016 as an alternative secondary years curriculum in remote and very remote schools. A whole-school approach to positive behaviour was developed with 79 schools engaged in social and emotional learning curriculum. 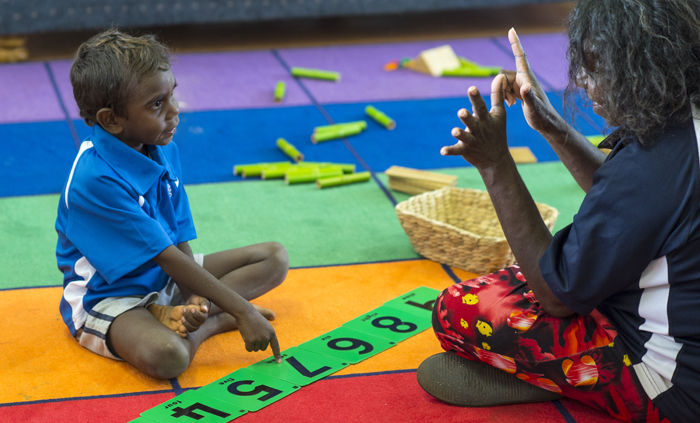 Literacy and Numeracy Essentials (LANE) programs and tools were implemented in 74 remote schools across five regions and teaching resources supporting LANE have been finalised. All remote schools have implemented new diagnostic testing for years 1 to 10 in reading and maths to help teachers improve support for students. New resources to support principal performance, coaching, mentoring and remote principal inductions were created with 95 principals and senior teachers engaged in coaching programs in 2017. Community engagement charters were developed in very remote schools and will underpin and inform the new Community Engagement and Community Led Schools initiative. The Department of Education (DoE) is committed to continuing to drive improved Aboriginal education outcomes through the 10 year Indigenous Education Strategy 2015-2024 to ensure that all Aboriginal students in the Northern Territory have the opportunity to engage, grow and achieve. An independent evaluation of the first stage of implementation is currently being conducted by external consultants ACIL Allen. The final report is anticipated to be published towards the middle of 2018.